In a recent interview with This Is 50, Lil Durk explains his beef with Tyga. He says the feud started when they were recording together in Los Angeles. Tyga became upset at something and the issue escalated. “I got all the questions [answered] on the mixtape, though,” Lil Durk says, referring to his forthcoming Signed to the Streets 2. The dispute resulted in a lyrical battle. Lil Durk dissed Tyga on Meek Mill’s “Chiraq Freestyle.” Tyga responded with “Chiraq to LA” that featured Game. Lil Durk says he heard that Tyga paid Game to appear on the response track. During the This Is 50 interview, Lil Durk says he’d like to get at “Tiffney,” whom he refers to as Game’s wife. Game has been engaged to Tiffney Cambridge, though the two did not wed. 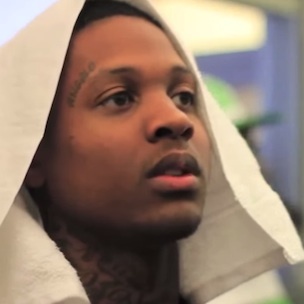 Elsewhere in the interview, Lil Durk also expresses his concern over the violence in Chicago. In May, Lil Durk announced his forthcoming album via Twitter and said it will be called Remember My Name.